The UK should move towards simpler tax rules, the Conservatives have said. Shadow chancellor George Osborne says Britain should investigate the merits of a "flat tax" - where everyone pays the same rate regardless of earnings. He says his party failed to win trust over tax cut pledges because they too often look like "election gimmicks". But he says he is not advocating a "pure flat tax" system, adopted by some European countries, because it would mean the loss of pension tax reliefs. A flat tax system has been introduced in 11 countries, mostly in eastern Europe. Under the scheme, all income or corporation tax over a certain untaxed personal allowance is set at the same rate. Mr Osborne says he wants to see the UK moving towards "a simpler tax system which is simple to understand, where there are no loop-holes, where the very rich do not avoid tax by employing expensive accountants". "I am fully conscious that we may not be able to introduce a pure flat tax, but we may be able to move towards simpler and flatter taxes," he told BBC Radio 4's Today programme. "What I am really talking about is removing a lot of the complexity from the tax system - a lot of the reliefs and exemptions - in return for either a lower rate or a bigger tax allowance. "The rest of the world, including many countries in Europe, are reducing taxes." Mr Osborne said Prime Minister Tony Blair, who is visiting China and India, had been talking about how the world can deal with intense competition from the two emerging economies. "The rest of the world is responding to that by reducing taxes - in this country we are increasing taxes and making our tax system more complicated. "It is out of kilter with the rest of the world. It's not good for the British economy, and I think it shows that my opponent, Gordon Brown, is stuck in the thinking of the past, whereas the Conservative Party is open to thinking about the future." He made the comments ahead of a speech to the Social Market Foundation in which he will announce his party's appointment of an independent commission to look at having "flatter" taxes in the UK. 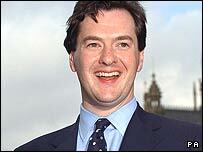 He denies the system would be regressive, saying earnings up to about £10,000-12,000 a year would not be taxed at all. Mr Osborne said he accepted that the Tories had not "made an economic argument" for tax cuts at the last three general elections, or that they would deliver jobs and prosperity. "More striking, our tax-cutting manifestos have not helped us gain a reputation for economic competence or even won us the trust of the public on tax issues," he said. Critics of flat taxes also suggest tax cheats would simply divert their attention from fabricating their expenses to hiding their income under a "flat tax" regime.